Use this first-generation SBI CAG-hspCas9 SmartNickase when you want to reduce off-target events, have transfectable cells, and prefer an intact vector. For pre-clinical and other applications where you need to minimize off-target Cas9 activity and are using transfectable cells, All-in-one Cas9 SmartNickase plasmids are an excellent choice. 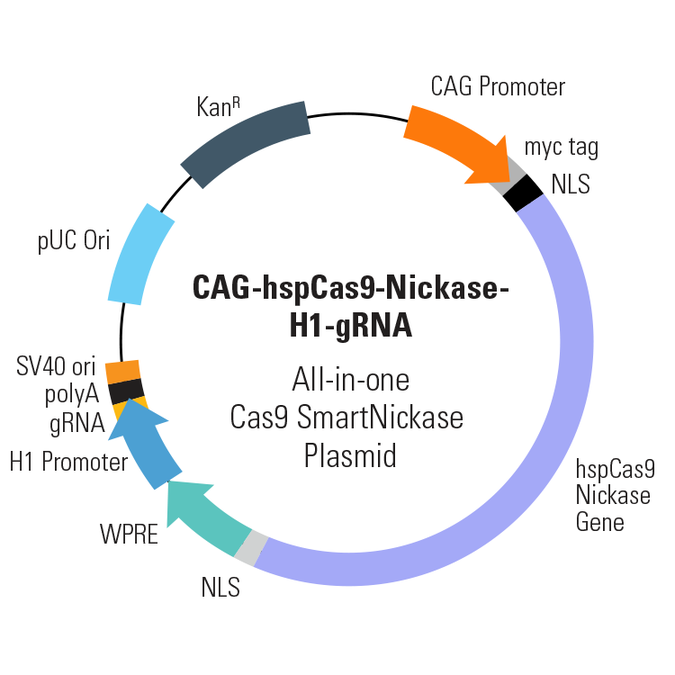 Unlike our newer Cas9 constructs, this first generation Cas9 SmartNickase—CAG-hspCas9-nickase-H1-gRNA All-in-one Cas9 SmartNickase Plasmid—does not contain a selectable marker for identifying transfected cells and is now available as an intact, circular plasmid. Unlike the wildtype Cas9 protein which introduces double-strand breaks (DSBs), the Cas9 SmartNickase introduces paired nicks at the gRNA-directed site. Creating nicks favors the higher-fidelity homologous recombination process over non-homologous end joining (NHEJ), with paired nicking shown to reduce off-target activity by 50- to 1,500-fold in cell lines, and to facilitate gene knockout in mice without losing on-target cleavage efficiency1. As with all of our Cas9 Nickase delivery options, the CAG-hspCas9-nickase-H1-gRNA Plasmid is functionally validated and comes backed by our expert technical support team—if you’ve got a genome engineering question just ask by emailing tech@systembio.com. Ran, FA. Genome engineering using the CRISPR-Cas9 system. Nat Protoc. 2013 Oct 24; 8:2281-2308. PMCID: PMC3969860. Figure 1. The All-in-one Cas9 Null Nuclease Vector shows no genome editing activity. We compared the activity of wild-type Cas9 (EF1α-hspCas9-H1-gRNA All-in-one SmartNuclease Plasmid, Cat.# CAS900A-1), Cas9 SmartNickase (EF1α-hspCas9-nickase-H1-gRNA All-in-one SmartNickase Plasmid, Cat.# CAS800A-1), and Cas9 Null Nuclease (EF1α-hspCas9-DM-H1-gRNA All-in-one Cas9 Null Nuclease Plasmid, Cat.# CAS805A-1) to insert a GFP reporter at the AAVS1 site through the use of AAVS1-targeting gRNA and an AAVS1-targeting HR Targeting Vector (AAVS1 Safe Harbor cDNA/miRNA Targeting HR Donor Vector (pAAVS1D-PGK-MCS-EF1α-copGFPpuro), Cat.# GE602A-1). (Left panel) Fluorescence (left-most column) and bright field (right-most column) microscopy showing that both Cas9 SmartNuclease (top set) and Cas9 SmartNickase (middle set) are able to insert GFP into the genome, whereas the Cas9 Null Nuclease is not (bottom set). (Right panel) A Surveyor Nuclease Assay corroborates the lack of genome editing capabilities of the Cas9 Null Nuclease. The lack of cleavage seen in the SmartNickase lane is likely due to the lower frequency of GFP insertion.